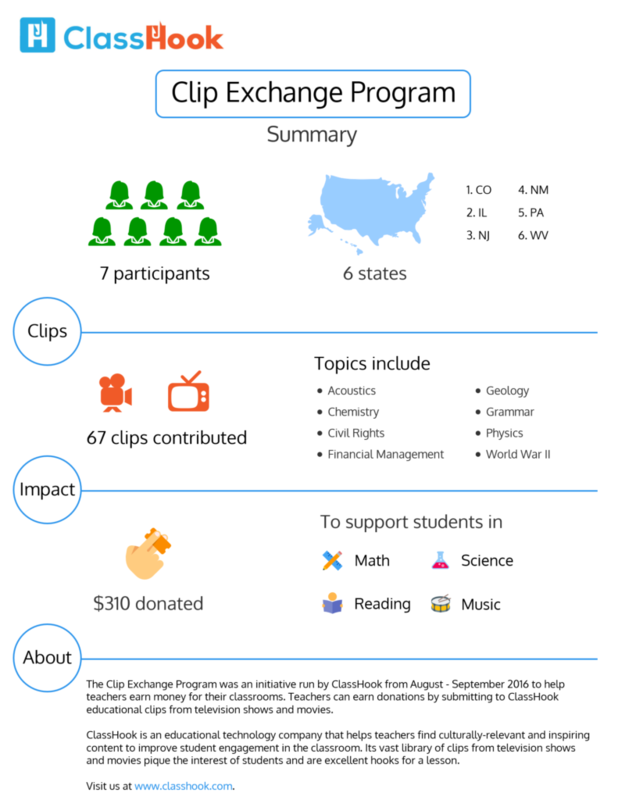 On August 18, 2016, we launched the Clip Exchange Program, an opportunity for teachers to earn donations towards their campaigns on websites such as DonorsChoose and GoFundMe. To earn donations, teachers had to submit educational clips from television shows and movies to our website. The Clip Exchange Program ended on September 16, 2016, and we are pleased with the outcome. Before I share the results, I’d like to briefly touch upon our objectives of the Clip Exchange Program. We had some assumptions going in, and we wanted to test them. Since we first launched ClassHook, we’ve made it possible for anyone to submit clips to us. After all, if a teacher uses an awesome clip in class, why not give her the opportunity to share it with others? However, we noticed that teachers weren’t sharing their clips with others because they usually did not have time in their busy schedules. After talking to a few teachers, we learned that some sort of incentive to submit clips would be encouraging for them, so we wanted to see if that would be true for other teachers as well. 2. Find out if it is common for teachers to have their own collection of TV/movie clips and the breadth of these collections. Before starting the Clip Exchange Program, we knew that teachers used TV and movie clips in class, but we weren’t sure how commonly they were used. How many teachers have a personal clip collection, and how expansive is that collection? 3. Expand our library of available clips. As part of our effort to grow our content library, we thought the Clip Exchange Program would be a wonderful way to help teachers raise the funds they need to create compelling classroom experiences and also crowdsource clips that are used in the classroom. 4. Support teachers and their classrooms in the coming school year. As a company, our goal is to improve education for both teachers and students. We’re primarily tackling student engagement through culturally-relevant and engaging content, but if we can also support teaching and learning in another way, we should absolutely do so. We’ve created an infographic to summarize the outcome of the Clip Exchange Program. Click on the infographic below to see it in full-size. Seven teachers from six different states participated in the Clip Exchange Program. These teachers contributed a total of 67 clips to ClassHook’s library, on topics ranging from Acoustics to World War II. We donated $310 to classrooms to support students learning math, science, reading, and music. So, did we achieve our goals? Absolutely! While our sample size was limited, the Clip Exchange Program gave us strong evidence that teachers are encouraged to submit clips to ClassHook if there is an incentive to do so. We also learned that some teachers use quite a lot of television and movie clips in their classrooms: two participating teachers each submitted over 20 clips! The best aspect of the Clip Exchange Program is that we supported classrooms in the process of gaining these insights. We’re delighted that we had the opportunity to support teachers and their classrooms through the Clip Exchange Program, and we hope you have found our findings insightful. We plan on running another program similar to the Clip Exchange Program in the future, so keep an eye out on our website and Twitter (@ClassHook). Please share any thoughts in the comments below or on our website. This entry was posted in ClassHook Reports, Popular Media and tagged Clip Exchange Program, Clip Library, Clips, DonorsChoose, Popular Media, Report, Stats, Supporting Teaching and Learning. Bookmark the permalink.